July 28th, 2013 — Nashville, TN: Several musicians in Nashville, Tennessee have taken the AFABW Pledge to The Arts and adopted it for the Musicians In Action Guild. Formed in 2009, the Musicians In Action Guild is a Gung-Ho group affiliated with the Church of Scientology in Nashville. The Guild is now in its fifth season of delivering quality showcases, concerts and benefits for no charge to attendees. Additionally, the Guild has supported the many music and personal improvement seminars given at Celebrity Centre Nashville over the last four years. Now that the Guild has been recognized with a Federal ‘Charitable Organization’ status the following projects are authorized for immediate funding to support its continuance and expansion. 1) A The Way To Happiness Campaign designed to be used to further the precepts of The Way to Happiness through local businesses, starting with music oriented establishments in Nashville, which number in the hundreds. 2) A recognition and appreciation ceremony for the hundreds of bands and solo artists who have graced the Celebrity Centre Nashville stage and given freely of their time. Their efforts have continued to make Celebrity Centre Nashville well known within and outside of Nashville. For those interested in fund raising for the Guild and its purposes as stated below in the Pledge To The Arts, as well as for the Way To Happiness, there is adequate compensation. Please contact the Guild for details. 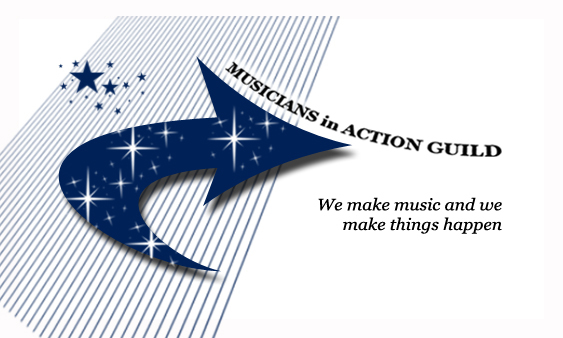 I pledge to support Musicians In Action Guild in helping to create a new Renaissance for Mankind. All messages will receive prompt attention.